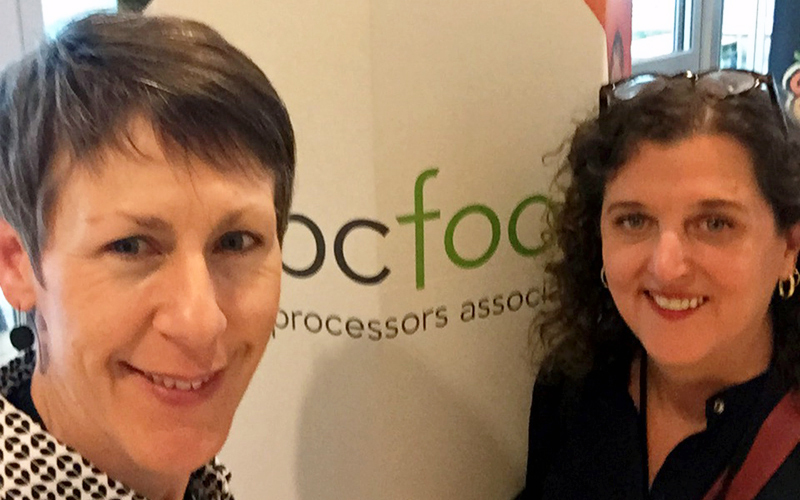 Last week, Pam Brain and I attended the BC Food Processors Association’s annual industry event – FoodProWest 2017. It was the BCFPA’s 10th anniversary and their largest event yet, attracting over 700 food and beverage processors and industry stakeholders. As a first-timers at this show, we were happy to see the range of new and established brands represented. One newborn brand that caught my eye, and delighted my taste buds, was Nora’s non-dairy ice cream. This show was their launch party, so to speak, as they were introducing their product to the trade for the very first time. Made with a combination of coconut milk and cashew milk, this ice cream is unbelievably creamy and comes in four summer-worthy flavours. For the sake of dairy and non-dairy ice cream lovers everywhere, I hope they secure some distribution quickly because I need more Nora’s this summer! Sun-Rype, a legendary BC food brand that’s been around since 1946, was also exhibiting at the show. Over the years, they have expanded their range of products from the 100% pure apple juice that so many of us grew up with into other juices and beverages, fruit snacks and more. But they also sampled some exciting new products at the show that I hadn’t seen before. Of their four new Sparkling Teas, the Green Tea Honey Lemon was my favourite. It was light and refreshing, with lots of flavour, and would make a great mixer for a summer cocktail. I was surprised to see they also now have a hard cider, which originally launched as a special edition product last summer to celebrate Sun-Rype’s 70th anniversary. It did so well they decided to make it a permanent addition to their product portfolio, which can be found at select private liquor stores in BC and Alberta. Another discovery at the show was a line of amazing Indian sauces from Sutra Foods. Paul Gill and his wife, Pari, make delicious sauces that are easily transformed into meals with the addition of vegetables or protein. We both loved the Korma sauce, which was as tasty with salmon as it was with chicken. For consumers and foodservice alike, these bagged sauces are a handy option for full-flavoured Indian goodness without having to spend hours in the kitchen. One of my other favourites at the show was a protein bar made of bugs—crickets that is. Coast Protein uses cricket flour to deliver 10 g of protein per bar. The founder, Dylan Jones, is passionate about increasing the acceptance and consumption of this sustainable protein in North America. The samples we tried were delicious and you really couldn’t tell they contained ground crickets. Kudos to Dylan and his team for creating tasty and nutritious insect-based foods. As someone who has worked for and represented many food brands across North America, it makes me proud to see these exciting food and beverages coming from BC. I think our entrepreneurial spirit is part of the secret sauce that makes the West a hotbed of innovation, especially in healthy and sustainable products. All this continues to feed my desire to help make BC brands a success, across the country and North America, through smart marketing strategies.